Fruit and nut sweet served with fresh cream, custard or ice cream. Wash the dried apricots and soak in water for twelve hours. Remove stones from the apricots if they are present. Slowly cook the apricots in about 2 tablespoons of water, in a heavy bottom pan for 15 minutes. Add the sugar and continue to simmer for another 20 - 30 minutes on a low heat. Blanch the almonds and chop into small pieces. Add this to the apricot mix. To finish, garnish with some whole nuts. 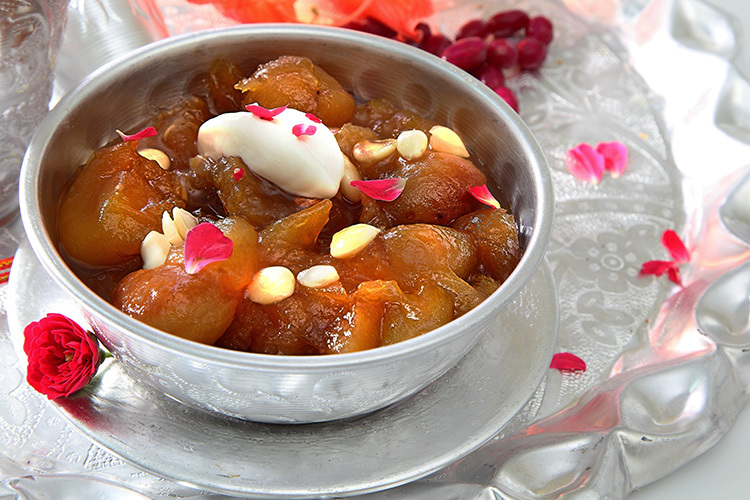 Khubani Ka Meeta can be served with fresh cream, custard or ice cream.